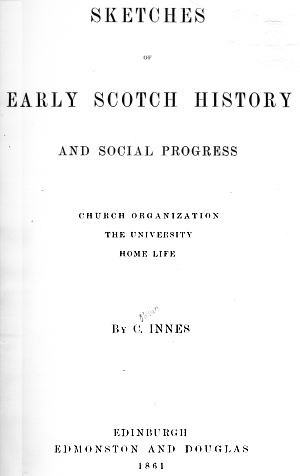 Meaning of the word—Different causes of placing Churches— Foundation and Founder to be traced by various circumstances—Primeval Monasteries for instructing Teachers— Glasgow Inquest of 1116—-Proof of very ancient Endowments—Other traces of ancient Endowments—Abthanies— Monasteries before David I.—Revival of Christianity in the twelfth Century—English Settlers and their Settlements— Appropriation of Tithes to specific Churches—Creation of Parish—Ednam—Melrose—Subdivision of parishes—Wiston, Roberton, Crawford-john, Symington—Culter, on the Dee— Glen-Bucket, its Origin—Arndilly, Bucharm—Lamberton— Mother Churches and Chapels—Burghal Parishes, Edinburgh, Aberdeen—Stirling, Dunipace and Larbert—David I. 's revival of Monasteries—Parish Churches absorbed—Sources of Parochial History—-Records of the Bishopric-—of Religious Houses—Ancient valuations of Benefices—Taxation of Churches for the Crusades—Antiqua Taxatio—Verus valor—Baiamund's Roll. Kentigern—The Interval till David I.— Ancient Possessions of the Church—Church dedicated, 1136—New Acquisitions-Successive Bishops—Origin of the City—Bishop Jocelin—Restoration of Church—Tithes given from Carrick and Lennox —Papal Dictation—Burgh oppressed by Eutherglen—Judicial combat used among Churchmen—General Collection for the fabric of the Church—Archdeaconries—The Use and Constitutions of Sarum adopted—Old boundaries of the Diocese— Edward I. at Glasgow—Reign of Robert I.—Bishop Robert Wishart—Bishop Lindsay—First Hamiltons—First Bridge over Clyde—Proofs of Legitimacy of Robert III.—Inventories of Jewels and Books—Bishop Lauder—Bishop Turnbull— University Founded—Glasgow an Archbishopric—Disputes with St. Andrews—Archbishop James Bethune—The Reformation—The City of Glasgow—The Bishop's Dwellings— One day of Old Glasgow. Bishop Andrew—Bishop John mutilated—Bishop Adam—His murder—Bishop Gilbert de Moravia—His constitution of the Cathedral—Constitution of Lincoln adopted—The Chapter of Caithness—Scotch Cathedral society of old. Its foundation—Monastery of Morthlach—Bishop William Elphinstone—Policy of the old church. Old feudal tenures—Scotch jurisprudence—Galloway customs— State of cultivation—Pasture—Forest—Game—Old boundaries—Old roads—Early spoken language—Prices of land and value of money—Old families extinct—Seals, Arms, Early Heraldry—The Monks as landowners and patrons— Fair play to the Monks. Culdee foundation—Re-formed by Alexander I.—The fatal stone-—Coronations at Scone—Privileges of the Abbey— Duel, ordeal—The connexion of Scone with Caithness— Family of Ruthven. Position of the Abbey—Foundation—Destroyed by Richard II.—The last Abbot, Mark Kerr—Abbey possessions—Early coal working—Rural affairs, pasture, granges, right of passage, the Abbey wool—The Vale of Lethan—Tombs in the Abbey—Queen Mary de Couci—Catharine Mortimer—Benefactions of the Douglases—The Lindesays—Abbey buildings —Original crypt remaining. Abbey dedicated to Thomas-a-Becket—William the Lion its founder—Rapid acquisition of property—The Culdees of Abernethy—Lay appropriation of ancient Church endowments —Ancient customs—Judicial procedure—Military service— Extent—The Brecbennach and custody of the Abbey banner— Abthanies—Old names, Abbe, Falconar, Dempster—Domestic manners, hostelage in Stirling—Culdees—Forgotten Saints— Evidence of ancient bridges over the North Esk, the Tay, the Dee, the Spey—Abbey buildings—Offices of the Abbey—The dignity of the Abbot—Burgh of Arbroath—The Harbour— Fights of the Lindesays and Ogilvies—Tomb of William the Lion—Effigy of Thomas-a-Becket—Old customs—Banking —The schoolmaster—The Abbey advocate—Great Angus families extant and extinct. Situation—Old Roxburgh—Population of the district—Character of the Borderers—Abbey changed from Selkirk to Kelso —Historical curiosities—Edward III. 's renunciation of the superiority of Scotland—Charter of John Balliol in the tenth year of his reign—The Douglas origin—Proxies to Parliament—Boundaries of the kingdoms; of the Bishoprics of Durham and Glasgow—Celibacy of the Clergy—Wycliffe's followers—Agricultural occupation of the Abbey lands—Rental of 1290—Sheep, cattle, and brood-mares—Steel-bow —Services of tenants—Multures—Rents—Military services —Character of the Monks—Abbey buildings—Destruction of Kelso—The Abbey defaced—Style of Architecture. Earldom of Strathearn—The old Earls—See of Dunblane— The Earls the patrons—Foundation—Endowment of the Abbey—The Earldom a Palatinate—Annexed to the Crown —Arms of Strathearn. University founded 1450-1—Papal foundation and privileges —The University before the Reformation—Ruined—College after the Reformation—Andrew Melville's teaching—Its effects—Degree of M.A.—Wodrow's Graduation—Josiah Chorley at College—College in 1672—Laureation—Ceremonies—Thesis; Wodrow's, M'Laurin's: Hutchison's Inaugural Oration—Studies in 1712—The University in later times—University buildings—Places of meetings of old—The Faculty of Arts—Auld Pedagogy—The present fabric—The Mace—Old domestic economy of the College—Reid's account of University life. The Black Book of Taymouth—Sketch of Family History— Black Colin of Rome—Sir Duncan; slain at Flodden— Colin built Balloch—Sir Duncan ; " Black Duncan of the cowl"—His rural improvements—Building of houses and bridges—Travels—Cultivates Literature—Romances, Poetry —Sir Colin—Fond of Latin, French, and Italian—Cultivates Art—A German painter—George Jamesone—Jame-sone's prices and speed of work—List of his works at Taymouth. Chronicle of the Curate of Fortirgall—Record of the Weather —Notice of passing Events—Deaths of Rizzio, Darnley, Murray, Archbishop Hamilton, without comment—Last Entry, 1579. Duncan Laideue's Testament—A satirical poem—Who was Duncan Laideus?—Account of the Poem—Extracts. Bonds of Friendship —Deeds of Adoption—Fostering in the Highlands—Its purpose—Fostering of young Argyll with Glenorchy—Correspondence about him—Clan Customs— Early Highland Farming—Usual Provisions—Household Gear—Arms—Bows and Arrows—Jewels—Plate—Furniture—Pictures—Baron Court Law—Trees—Irrigation— Speats—Wolves—Antique Law, Cleansing by Compurgators —"Borch of Hamehald"—Superstition—Whisky—Rod-Fishing in 1632—The Country Arming in 1638—Kilchurn Castle—Hereditary Bards—The Deer Forest—Police of the Country—Ferry and Hostelry—Feud with the Clan Gregor —Aquavitae—Leases to Craftsmen, the smith, the dyker, the gardener—Stud of Brood Mares—Fowling by Dog and Net —Letters of Correspondence—James VI.—Venison and Game—The White Hind—Fir Seed and Planting—The Coygerach of Saint Fillan. THE COYGERACH OF ST. FILLAN—p. 389. The Coygerach (or Quigrich) of St. Fillan has emigrated to Canada, as mentioned in the text (p. 394). Dr. Daniel Wilson, Professor of History, at Toronto, the author of Pre-historic Annals of Scotland, who drew public attention to it in that valuable book, has been fortunate enough to disinter the actual relic in his new country. Dr. Wilson takes it for granted that it was the reliquary used for containing the arm of St. Fillan, and explains how it may have served that purpose. That supposition seems to me mistaken; and the drawing and description given by Dr. Wilson leave no doubt that, whatever may have become of the arm of the Saint and its case, the Coygerach was one of those rich crozier-heads so frequently met with in church treasuries in Catholic countries, many of which have had mysterious virtues attributed to them. It is, says Dr. Wilson, a beautiful and elaborately wrought shepherd's crook, of silver gilt, wrought on a hollow core of copper, and measures nine and a quarter inches in height, and nearly seven and a half inches across from the point of the crook. The interlaced knot-work and other ornamentation is such as is well known on some of the silver and goldsmiths' work of early Italian work. The front is jewelled with a large oval crystal. Above this is a figure or bust of an ecclesiastic; while the lower end of the ridge terminates in the form of a snake's head, common on bronze relics of a late period. The relic is now in the possession of Mr. Alexander Dewar, whose father carried it to Canada in 1818, and whose name, as well as the custody of the Coygerach, seems to mark him as a descendant of the Deores, the ancient custodiers.